It is a fascinating being able to not only watch a dance work that has been developed from academic research and practice but then discuss the project with an arts practitioner who is as eloquent about the science as the movement he has created. Jack Philp Dance has been working with academics both at the from City University London and Cardiff University on cognitive neuroscience to devise, design and create a dance called Psychoacoustic to share with the public – i.e.us. Without trying to explain cognitive neuroscience, let’s just say the dance stems from the work being carried out to explore the body and brain responds to sound. To quote the choreographer directly, Jack Philp, the choreographer and founder of the company, said: “This piece is science doing dance and dance doing science. Something physical, something tested and something seen and heard. So does it work for an audience? The answer is a big yes, whether you were an audience member who took up the invitation to stand around the space (purely the black box of the Dance House rehearsal space and large, white, back-lit square panels on ceiling and sides) or sit in the racked seating watching both the performers and those other voyeurs / watchers / investigators on the floor. 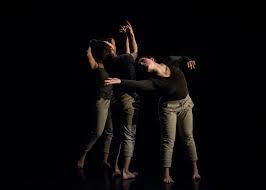 The three dancers have distinctive dance vocabulary and largely do not interact during the work but express their own experience through movement and also facial expression. With audience members in the space, they also move around them, not necessarily reacting to them but subtly adapting their choreography accordingly. The effect of the lighting and set, having people observing the movement and the space being a large empty void for the sound design from Ben Corrigan and Carol Jonesto inhabit, gives that experimental, clinical and TEST feel. Whether intended or not, if you are in the space you observe not only the performers but other observers, while not being certain how much to move around to see from different site lines. The second performance was a beautiful, flowing work Lumen, in which physical interaction is the bond between the same three dancers, Alistair Wroe, Gaia Cicolani and Dominic Rocca. The theme is light and stellar light at that and again has roots in science, collaborating with Cardiff University’s School of Physics, and is a perfect accompaniment to Psychoacoustic with its contrasting choreographic style, overarching feel of the work and the emotional elicited response from the audience and also between the dancers. While the dances stand on their own, the conversation with choreographer and dancers after the show proved stimulating in not so much explaining the work to a baffles audience (often an unwelcome use of post-show talks when performance should have its own validity) but the project, its origins and a genuine interest in the audiences response and the works ongoing development. Further performance Venue Cymru, Llandudno, November 27.